The House Ethics Committee has recommended, by a vote of 9-1, that Rep. Charles Rangel, D-N.Y., be censured by the House of Representatives. The decision marks the end of an almost two-year investigation into allegations that Rangel misused his office to solicit funds for a college center bearing his name, used a rent-controlled apartment for a campaign office and failed to report income or pay taxes on a villa in the Dominican Republic. Earlier this week, the committee found Rangel guilty on 11 of the 13 charges. Before the committee met in private to determine the sanction recommendation, Rangel apologized to the committee but asked that he not be accused of gaining personally through his actions and only of being sloppy. The House of Representatives will now vote on whether to censure Rangel, and will need a majority to make censure official. According to the Congressional Research Service, 21 members of the House and one delegate have been censured. House Members have been censured for various types of conduct, including insulting language on the floor, assaulting another Member, supporting recognition of the Confederacy, selling military academy appointments, bribery, payroll fraud where inflated staff salaries were used to pay a Member’s personal expenses, receipt of improper gifts and improper use of campaign funds, and sexual misconduct with House pages. There are no House rules governing the consequences of a censure. According to the report, some members resign rather than face the humiliation of a formal censure by their peers. 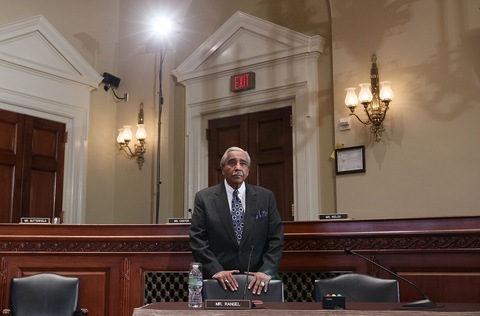 The committee recommended today that Rangel pay back taxes on his villa. Earlier, the ranking Republican member of the ethics committee, Rep. Jo Bonner, chastised Rangel for the ethics violations and said it was unfair to Rangel’s constituents that the committee did not reach a conclusion before the November election, in which Rangel was re-elected. “It is painful for me to say this to a man I so personally respect. But Mr. Rangel can no longer blame anyone other than himself for the position he now finds himself in. Not this committee, not his staff or family, not the press. Mr. Rangel should only look into the mirror to see who is to blame,” Bonner said. Committee member Rep. Michael McCaul, a Texas Republican, said he thought reasonable people could disagree as to whether Rangel’s solicitation of funds for a center named after him was corruption, though he thought it was corrupt for Rangel to do so. Head counsel Blake Chisam said the committee has recommended sanctions to the full House 16 times in its 43-year history. Before recommending censure, Chisam used hypothetical examples of how average citizens would react to Rangel’s conduct to illustrate why it discredited the House of Representatives. He used the example of a new non-profit organization trying to solicit funds in order to remain solvent, only to find out that Rangel used his position as a congressman to solicit funds for the college center bearing his name. The center aim was to encourage minority students to enter public service. “What kind of example is that of what public service ought to be?” Chisam asked the committee. Rangel brought Rep. John Lewis, known for helping to organize protests during the civil rights movement, to speak to Rangel’s character. “He is a champion for those who have been left out and left behind. I must tell you that Charlie Rangel is a good and decent man,” Lewis said, also telling the committee that Rangel participated in civil rights marches in Alabama during the 1960s. The committee is discussing the possibility of censure in a closed session.